It’s just about time to dust off the garden furniture and get Spring inspired. All it takes to transform your garden or outdoor space and have it ready for BBQ’s, pool parties and long evenings under the stars; is a little make-over with a few of these clever landscape lighting ideas. Make a few small changes that won’t break the bank. LED lights are the most energy efficient and they last long. If you choose good quality fixtures then chances are you‘ll get many years satisfaction and you’ll not need an electrician to fit them. Don’t get carried away with flood lights. No one wants to be blinded in the back garden or fight their way through swarms of bugs attracted to hot bulbs. A few updated light fittings and groups of on-trend lanterns will without a doubt extend the enjoyment of your space well into the night. We love the latest landscape obsession with architectural screens. Some incorporate LED fittings and the light patterns thrown at night are quite spectacular. Lighting is like artwork. Your night time garden can be transformed into a magical landscape with new textures, shapes and silhouettes. For example; to illuminate a pathway or the walk up to the house, avoid creating a “runway” by placing lights directly opposite each other. Instead, stagger the lights in a zig zag pattern and the balance of light and shadow will be more welcoming while still providing safe passage. Choose your focal points first. Pick out your garden’s best features whether it’s the swimming pool, a statue or a specimen tree, then make a plan to highlight these individual elements with strategically placed lights. Illumination of objects nearby and in the distance will create depth to the landscape, adding instant intrigue to the garden around you. Don’t let off-the-shelf fittings convince you that outdoor lighting is limited to solar peg lights or fairy lights. There are some fantastic options, a little more non-conventional, which will have your guests hanging around for longer during the summer. If you’re the host with the most then you can’t go past string lights. Draped across your outdoor seating area they’ll set a tone of elegance and sophistication normally reserved for weddings! Well placed uplights at the foot of a tree create drama and staging, but if you’re keen to add a little more charm then place lights on a branch which will highlight the softer textures and shapes of the tree’s architecture. If it’s subtle and refined you’re after then downlighting is the way to go for the ideal ambience. Perthians are blessed with balmy weather and it would be uncharacteristic not to have an outdoor space for eating, entertaining and to generally unwind from the grind. It doesn’t matter what the size, the key to alfresco living is to extend your indoor space into the outdoors. Make sure you have some comfortable seating, shade and an outdoor kitchen or pizza oven is a bonus. If you lack greenery dress a courtyard up with a few specimen plants and place some of you favourite cushions on a wicker sofa to create an inviting sanctuary. Cleverly placed outdoor lighting can tie all these elements together. Light sources expand seating areas and create ambience making “garden rooms” as inviting as living rooms. The secret is to subtly highlight focal points, create a gentle wash of light with moonlight effects and illuminate paths and patios to tie the landscape and home interior harmoniously together. It’s not only new home builders, renovators or those undertaking landscape projects that seek the advice of lighting specialists. Professional lighting services are requested more and more to provide systems that effectively highlight the features of an established home and garden. Previously this service was thought out of reach and the running cost of lighting not worth the investment. Times have changed and lighting solutions are now more sustainable than ever before. LED lighting is actually considered environmentally friendly with low power consumption and a long life span thanks to the good quality fixtures available. Systems are intelligently designed to your budget, your lifestyle and the intended use of your outdoor space. 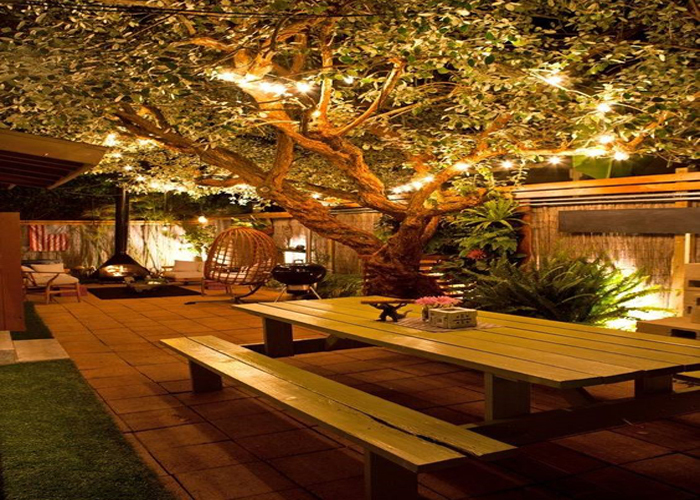 Perth Garden Lights offers a free consultation service so take advantage of their skills and let them turn your run-of-the-mill garden into something serenely spectacular. Call 0430 209 247.